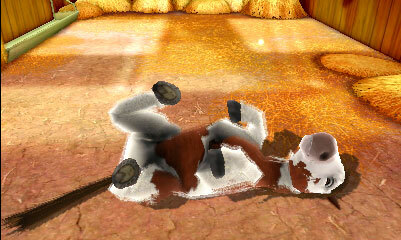 With that, welcome to the bright, colourful world of The Whitakers present Milton & Friends 3D. Of course, in some regard Milton’s right. Our day-to-day needs, such as food, water, cleanliness and comfort, are exactly the same as those of millions of animals across the globe that rely on human care – something that sadly, in some instances, many all too often forget. Due to this, many prefer to make a far more cost-effective and less time-consuming commitment to the realms of the virtual pet simulator, providing the responsibility for a real-life pet but with unquestionably less mess! Consumer popularity of such genre proved overwhelming, classic PC desktop simulator Dogz and the bygone era of the dreaded Tamagotchi craze during the late ’90’s exploring such concepts in differing forms. More recently, Nintendogs spurred new growth and played a large part in the Nintendo DS’ mainstream success, remaining the second best-selling title on the handheld. Those with any prior experience with the genre will know roughly what to expect from The Whitakers present Milton & Friends 3D then, a young foal placed into the care of the player whose needs must be continually tended to. Whilst an initial tutorial will see you looking after the rather dishevelled Stewball at the request of a local Vet, the player is soon able to create their very own foal from scratch. Extensive customisation options are offered here, choices enabling you to choose from breeds, coat colours, mane type, patterned spots and eye colour. At this point, you’ll then be able to name them, before choosing between differing boxes for your horse to enjoy as their home. From here, you’ll find yourself immediately required to monitor their fundamental needs under four basic parameters; Hunger, Thirst, Cleanliness and Morale. Fulfilling these will see the player partake in a range of mini-games of sorts, feeding your foal milk through a water bottle by continually adjusting the angle to ensure it can still drink without spluttering too much. Whereas grooming sees you brush your foal, before washing with a soapy sponge and rinsing off with a hose. Players are scored for their efforts, in turn alleviating your foals requirements in varying levels depending on the grade that you are awarded. Play Coins may also be exchanged for upgraded tools for use within such activities. Once your foal is content, you can then venture outside to a peaceful meadow where you can practice a range of activities. These include teaching your foal tricks by tapping in time to on-screen prompts, practising jumping through swiping the stylus in prompted directions, and throwing a toy at a flagpole for your foal to then fetch. 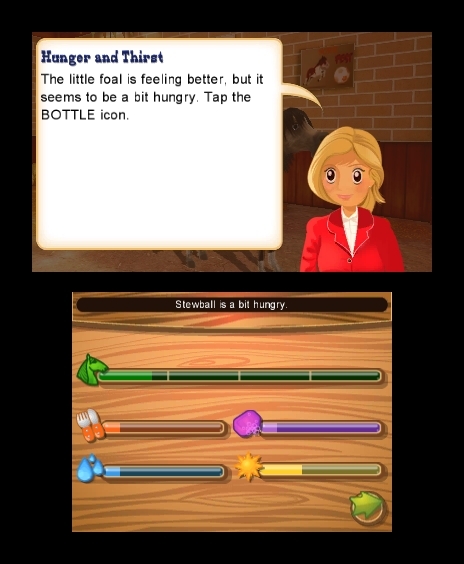 Lastly, there’s bridle, where the Nintendo 3DS’ gyro sensor comes into play and sees players tasked with keeping their foal within an indicated box on-screen. These are an enjoyable aside, and players will surely take great delight in seeing their foal succeed thanks to their efforts. Voice recognition, whilst not as sophisticated as that seen in Nintendogs + Cats, also sees your foal trot over to you once beckoned, through use of the handheld’s built-in microphone. 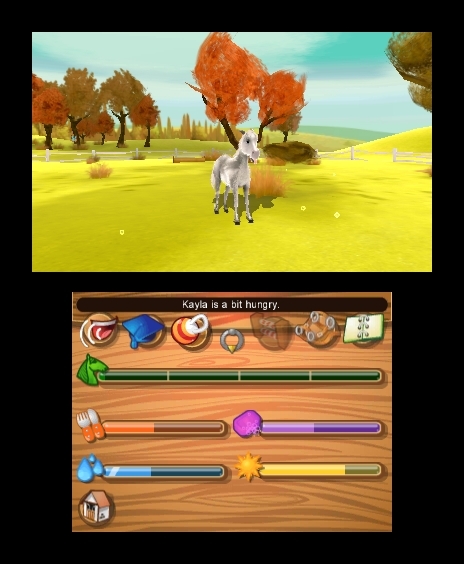 Further to this, players are also able to use the Augmented Reality card that came with the Nintendo 3DS to transport their cherished foal into real-world environments. You’ll be able to smother your foal with affection within a 3D space, taking photographs to capture those memorable moments. However, beyond this, there is a severe lack of further content for the player to engage within – the ability to unlock Trophies remaining to objectify the experience. Contests, an aspect that could have easily been expanded upon, is left purely for StreetPass use, seeing players go head-to-head in beauty competitions where you’ll have the opportunity to nab yourself additional in-game items. Whilst I clearly don’t lie within the boundaries of the ideal demographic for The Whitakers present Milton & Friends 3D, there’s something strangely endearing about the entire experience. Where it ultimately falls down, is a poor rate of reward coupled with a disappointing lack of depth, surely set to captivate younger audiences for only brief periods of time. However at such a surprisingly low £14.99 price point, and with such engaging, if not short-lived, activities, it proves hard not to recommend to those who find it appeals. Just prepare yourself for repetition.